Welcome to the official Triple Cream site! 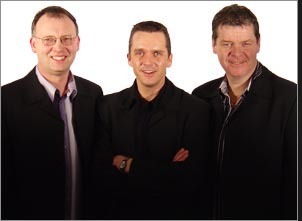 3 fellas who are multi-instrumentalists, excellent vocalists, impressionists and comedians in their own right. Keep people reeling in the aisles for over an hour, captivate an audience with sparkling personality. Major corporate events around the U.K. and abroad, including military establishments, private functions and comedy clubs, also appearing on B.B.C. and London Weekend Television. Triple Cream, one of the country's top comedy trios! With stand up comedy, musical parodies and audience participation it’s an act that’s full of entertainment for all tastes.